Guerlain Chamade: Surrender? In a Heartbeat! When I started thinking about this post, I couldn’t remember the exact occasion when Chamade came into my life. I have a documented evidence of the time when I didn’t have a single bottle of Guerlain perfume in my collection and was looking for guidance and inspiration from my readers. Then in the post that I published just a week later to report the success of my search, I mentioned that Chamade was the most recommended perfume by my readers and that I liked it and considered it as a “back-up” purchase should I have not found something even more desirable. So I assume that Chamade won me over lighting fast (“in perfume years”, I mean). Looking back I think that I might have gone for Chamade for my-first-Guerlain-perfume quest (instead of Cruel Gardenia, which I still love), had I seen in that Las Vegas boutique the real Chamade bottle and not the standard square store tester. But once I saw it several months later, the resistance was futile. There are many great reviews for Chamade out there, so if you somehow missed the story of the perfume, both romantic and not so much connotations of the name, origin of the bottle, revolutionary use of some ingredients and a lot more, I want to refer you to the comprehensive six-part series published on Perfume Shrine (start here), concise but informative entry on Monsieur Guerlain‘s site and poetic (and useful if you’re curious about different reformulations of this perfume) 5-star review on Bois de Jasmin. I’m positive that I tried the EdT version at some point but since my heart was taken by the modern extrait, I’ve never pursued real testing of any other concentrations or vintages. Chamade extrait feels very refined, elegant and poised. And the bottle… Even after I already had the real one in my collection, I couldn’t pass a vintage mini bottle in an antique shop. Since the perfume in the mini was slightly off, first I used the bottle in my Thinking Outside the Box project. 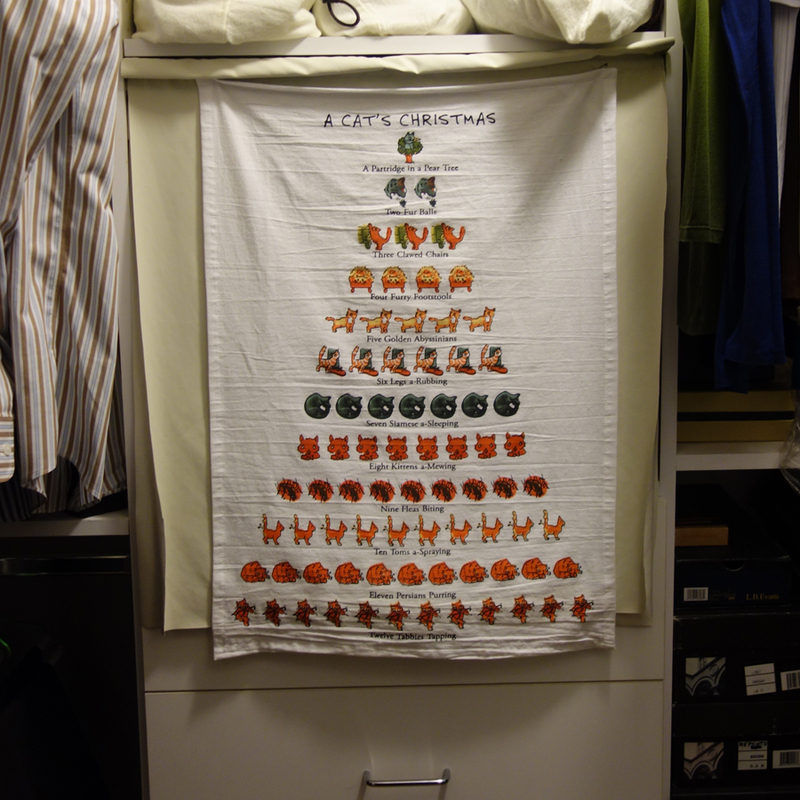 But recently I found an even better use for it. 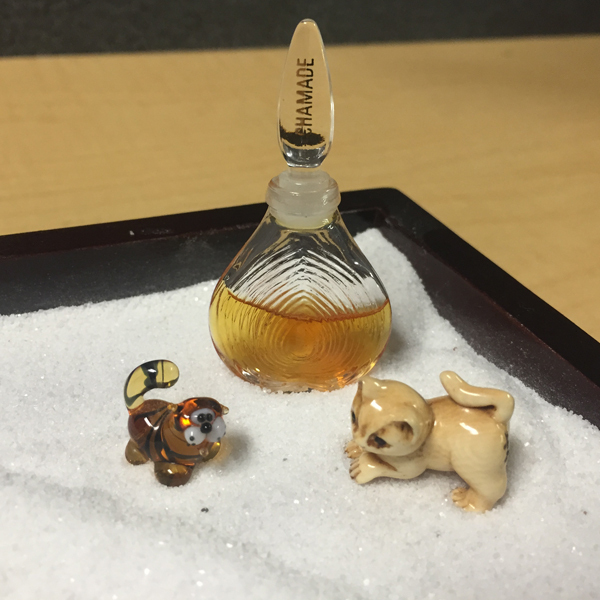 For many-many years I pondered the idea of getting a desk Zen garden. The problem was that, while I liked the idea, I’d never seen any of them in real life, so fearing disappointment, I kept postponing an Internet purchase in hope to come across it in a B&M store one day. 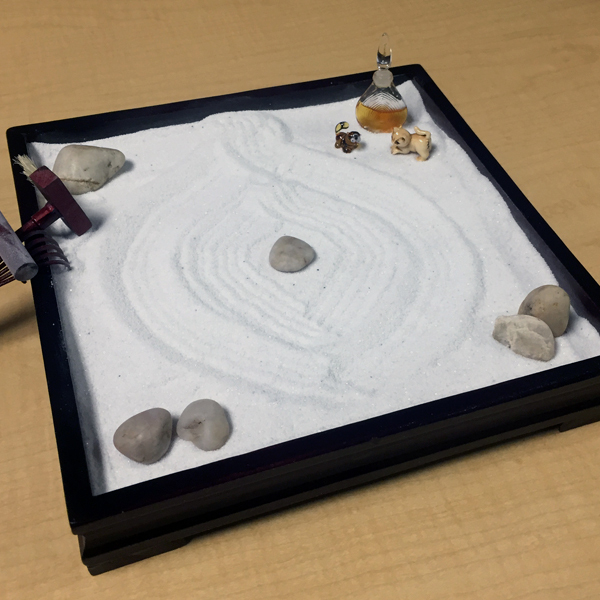 When I started in the new office earlier this year, I decided that after a leap of faith I’d taken with that move, I was desensitized enough to take a risk with Zen garden kit that I had in my Amazon wish list for the last decade. The set that arrived promptly was exactly like I imagined it! I unpacked everything, raked sand into some waves and circles, and carefully placed six rocks and two plastic cranes that came in the box in some deeply meaningful arrangement. I was happy probably for a couple of weeks. But then those plastic cranes started annoying me: they felt completely foreign – wrong size, poor liking and, in general, too much “made in China.” And then I figured out that I didn’t have to be limited by the original kit – and that was when the fun really began. I think Chamade looks very zen in my garden. While helping Birgit with charts for her Monday Question: Guerlain or Chanel? I was fascinated by the list of perfumes from Guerlain that respondents named as their favorites without which they couldn’t imagine their Perfume World. That was when I realized that I’d tried merely one third of all perfumes that others loved. 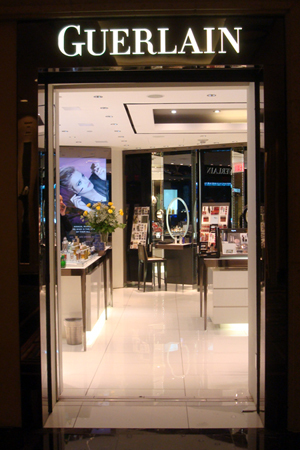 There is a Guerlain boutique at San Francisco Saks. It’s not too far from where I live but even a 30 minutes drive combined with the cost of downtown parking makes it an unlikely place I’d go casually to try one perfume after another. That’s why when I realized that during my birthday trip to Las Vegas I would be staying at the hotel that hosted the only stand-alone Guerlain boutique in the city… wait… or was it that I booked my stay at the hotel because of that?.. Anyway, I thought it would be a chance to try all those perfumed wonders and asked for an advice. 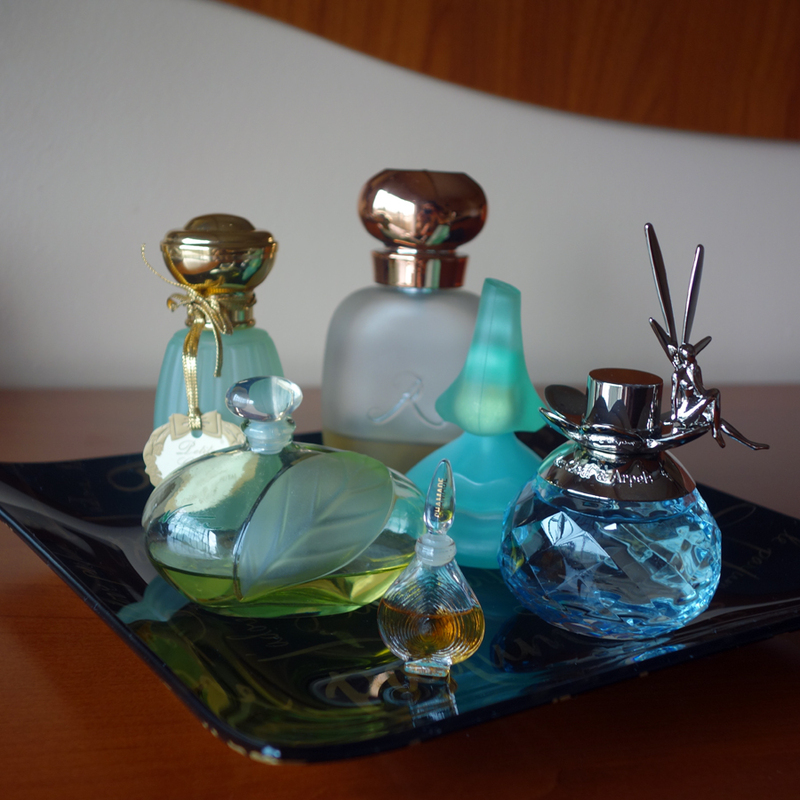 – 3 days are not enough to do justice to what a great perfume house has to offer (duh!). Once checked in, I immediately embarked on my mission. I went to the Guerlain boutique and explained my intentions to the SA who greeted me. He was professional and helpful but somehow we didn’t “click”. I might be wrong but I guess he didn’t think I would end up buying anything. Nevertheless we went through a number of bottles, I chose two to try on my skin and went on with my vacation. I came back the same day and then the next one, and the next – and everything repeated. I didn’t try Chamade this time because I tried it before and liked, so it was my back-up plan (together with Vol de Nuit) – I decided I would try these two and choose one of them if I wouldn’t find any other perfume that I’d like more. I still plan to seek samples of Chamade and Vol de Nuit to figure out if I can go with the EdT, EdP or need an extrait. But all those who suggested this perfume were right: I like Chamade. Suzanne, your bet on Samsara extrait would be safe: you were right more than you could imagine (but it’ll be a separate post next month – “How’s that for mysterious?” ©Natalie). Out of those perfumes that I tried on the skin two were a definite No: Nahema (“old lady perfume” on my skin – sorry to everybody who loves it) and Sous le Vent (I might try it again one day but this time it wasn’t close to what I was looking for). I need to test more Angelique Noire, Cuir Beluga and Bois d’Armenie: I liked them all but it wasn’t love. At least not yet. And then I took a blotter, inhaled and thought: This is the one! Probably you know that feeling when you smell a perfume and immediately like it. You do not need to work on it, learn to appreciate or let it grow on you. You just like it. That was what happened to me with Cruel Gardénia. It is extremely beautiful and the moment I smelled it I wanted to have it in my collection. I wore it twice and even though I had one more day to decide (or try more perfumes) I felt it would be right to get my birthday bottle of perfume on the actual day of my birthday. When my vSO and I went to the boutique the guy who was helping me previously (you see, I don’t even know his name since he’d never introduced himself!) wasn’t there. I felt a little bad since I usually try to be fair and buy from those SAs who helped me. But in this case it was for the best: Jorganne, who was there and helped me with my order, was just a right person for me. It was a very pleasant shopping experience including a hand-written card from Jorganne that came in my package (I had to have it delivered since we had only carry-on bags). Guess where I’ll be buying my next bottle of Guerlain. And I have no doubts there will be more. 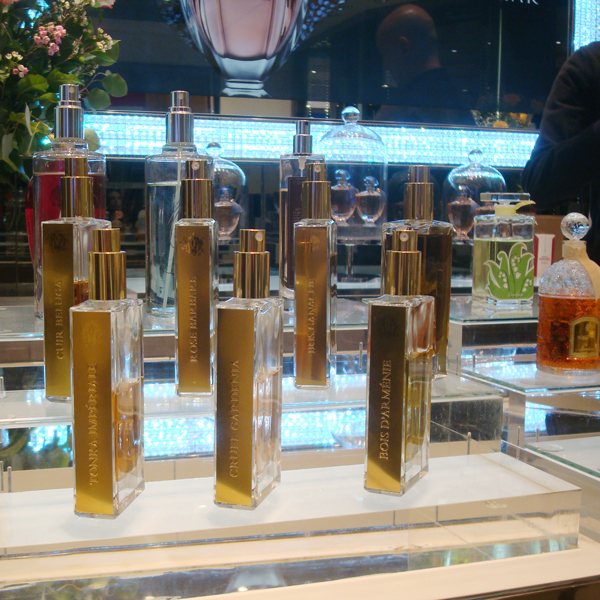 And finally, please meet Elena from Perfume Shrine – a Godmother of the first Guerlain perfume bottle in my collection. She was the first to suggest Cruel Gardenia and she wrote a beautiful review for this perfume. An honorable mentioning: Asali who seconded that advice.